Stop the clock; put it back! Now it’s March 1965 and the photographic world is waiting to see what Leica, regarded as the leading camera manufacturer, will bring out. It was hoped it would help counter the single-lens reflex cameras with which the Japanese industry was winning the markets. The names Canon, Nikon and Pentax were becoming familiar high-street brands, and Canon in particular hoped to take Leica’s crown. Steiner, the designer of the Leica ‘M’ series and arguably the finest camera design ever, gave me a peek preview of his SLR model. I was disappointed. That this bow-backed, clunky-looking product with a weird focusing screen would outclass the Canon, Nikon and Pentax products in the high street was hopeless. I made polite, gloomy remarks. Canon was ready to rain on Leica’s parade, and when the Leicaflex was announced the Japanese company responded with an innovative 35mm reflex camera called the Pellix, which had a 20-micron, fixed beam-splitter mirror. This made the moving reflex mirror and its mechanism unnecessary. Meanwhile, the German industry was still at the stage of declaring the instant return mirror unacceptable. ‘If the finder doesn’t black out, how can you be sure you’ve made an exposure?’ I was told. Progressive elements despaired. Canon’s rain certainly provided for much dampness. A few months later the Japanese Topcon RE Super introduced through-the-lens exposure metering in the conventional SLR and the other Japanese manufacturers followed suit. The Leicaflex CdS eye, occupying part of an area originally housing a selenium cell, gave an external reading. It was no contest, despite the superb new range of Leica SLR lenses. Yet none of the new wave of Japanese SLRs used a pellicle beam splitter rather than a flipping mirror, and none has since – although Nikon has produced a few specialist high-speed models in the F2 and F3 series. So how had Canon tried to upset the new Leica applecart with the Pellix camera? The answer is by using a pellicle, a skin-thick membrane. Canon had succeeded in making this pellicle so thin and transparent that, when used as a mirror, about a third of the light was reflected and two-thirds transmitted through it. Substituted for the reflex mirror in an SLR, you lose some of the exposing light, which makes the lens slower, as it were. However, the gain is that viewing is continuous – there is no black-out while the mirror flips – although when the lens shuts down to exposing aperture it causes a dimming of the view. Burst rates for continuous shooting could easily reach ten frames per second, which is regarded as a professional requirement. Plus, as there is less drag on the motor, the burst can continue longer with less battery drain. The whole complex mechanism of shutter/mirror was therefore no longer needed. A through-lens path for direct off-the-subject exposure metering was created, giving 12% spot metering as seen through the viewfinder. On the face of it, game, set and match. That was all very well, but there proved to be drawbacks. The membrane has to be taut with exactly equal tension across its area, otherwise there is an optical distortion effect visible in the image. Also, any dust settling on the membrane will be projected as a sharp shadow in the image. Above all, there was the slowing of the taking lens in an era when low-light operation was prized. 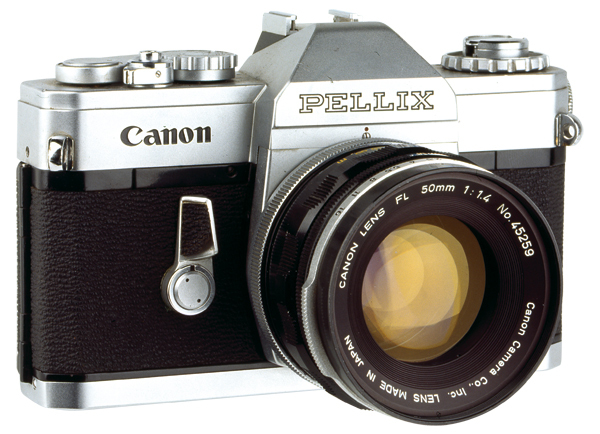 As a result, the Pellix camera did not penetrate the consumer market. Obviously, there were other technical advantages, notably the high frame rate that was possible when motor-driven. Special Pellix models continued to be built for special news and sports events. The following year an improved model, the Pellix QL, was introduced with a meter booster. It may be significant that the limited production has majored on bodies for long focal length lenses. Is there a problem with short focal length wideangle lenses? Canon did not return to the fixed mirror concept until 1989 with the EOS RT, which remained in production only until 1992. It was the first pellicle camera to use autofocusing, but the light loss, still about 2/3 of a stop, was difficult to accept at a time when zoom lenses of only f/3.5-4.5 were often standard fitment. I used the Canon RT and found it delightful to operate, with the quiet shutter, vibration-free run very pleasing. A special model, the EOS 1RS, was produced briefly in 1997, but since then 13 years have elapsed. Canon has continued to produce special models, and sometimes special lenses, and build bodies as required, throughout this period. For example, high-speed motor-drive versions were produced for the 1972 and 1984 Olympics. Now in 2010, Sony has picked up the pellicle torch and launched the Alpha 33 and Alpha 35 cameras this year. Just when we had forgotten about beam-splitters and were enjoying Live View, Sony has pumped fresh blood into the concept. The membrane beam-splitter may not have changed, but around it has grown up new technologies and conditions of use. So what has changed? There is one major advantage. All the Canon Pellix cameras have been full-frame models, whereas the new Sony cameras are APS-C format. Also, the smaller size is easier to protect mechanically and keep free of debris. As regards the membrane itself, Sony is not disclosing any data, but neither did Canon. However, piecing together what is known, the properties of the two are not that different. The reflected and transmitted proportions of the imaging light coming through the lens remain the same. That is, one-third of the light goes to the finder and two-thirds to the imaging sensor. 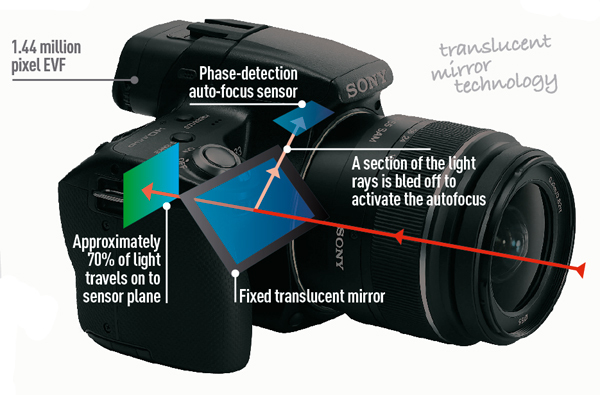 It was this ‘slowing’ of the lens that was disliked before, but Sony says it has dealt with the problem electronically by recalibrating the sensitivity values of the sensor to allow for the reduction. That presumably means, for example, telling the metering system an f/4 lens is actually transmitting at f/5. No problem there, but the light loss persists. There is also the dimming that occurs as the lens iris shuts down to the taking aperture. However, Sony believes that advances in optics have made this less of an issue. The next gain with continuous viewing is with automatic focusing, whereby the system can access an uninterrupted image of the subject. This should allow improved accuracy during rapid-burst shooting and particularly in predictive AF. Manual adjustment of the AF lock setting can be quicker. Next there is the prospect of interaction with Live View – and that will attract attention. 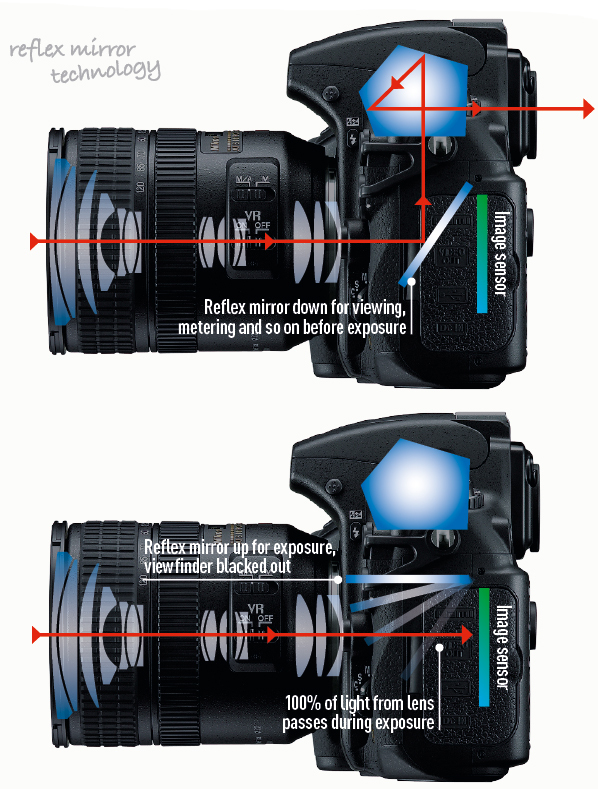 In a conventional DSLR, switching to Live View raises the reflex mirror, allowing the full amount of image light to fall on the sensor. When the mirror is moved up, the viewfinder is blocked out. With the fixed beam splitter, though, the eye-level viewfinder image continues unaffected while the LCD screen is in Live View mode. Also, the speed and accuracy of AF in Live View mode are claimed to be improved. This applies throughout all shooting modes, including when using the camera for short video clips – which is another obvious application that benefits from the fixed mirror. Another aspect, although one not so often referred to, is noise. The arrival of digital imaging has not rescued us from the clunk of the reflex mirror at exposure. With the fixed mirror, nature and wildlife photographers will welcome the absence of mirror noise, having only that of the shutter run. Other beneficiaries come to mind, including many in the technical and scientific sectors. In fact, the latter has used instrumentation with beam splitters for many years, the splitting itself done by prism or pellicles. The great Technicolor movie films like The Wizard of Oz and Gone with the Wind were shot with cameras using beam splitters, giving separate red, green and blue records. The light loss was massive so special super-intense lighting arcs were used, causing problems for the actors, but the director didn’t give a damn. Looking at the overall effect of the beam splitter on camera design, it is clear that the absence of a mirror and mechanism should allow more compact bodies, which is always an advantage. Sony suggests a 23% reduction. If the new smaller size membrane fulfils its promise, will the days of the moving mirror be numbered? That’s a big ask! It will go where the market demands. For Minolta owners, there is a helpful long inventory of existing equipment to encourage loyalty. Sony is bringing out two cameras that use its ‘translucent technology’. It has inherited the Minolta design team, and back in 1984 that team’s predecessor astonished the photographic world by introducing the first autofocus 35mm SLR system. Have this year’s team repeated the coup? We must now await the results of in-the-hand testing to see whether or not the pellicle has finally won. A Nikon D3 with a pellicle? Now there’s a thought.